This account was first published as ‘Adventures of a Despatch Rider’ in 1915. The author, an Oxford graduate, saw an advert in the newspaper shortly after war broke out appealing for motorcyclists. He promptly purchased his own motorcycle and enlisted. The account covers the first few months of the war until Watson became a subaltern in early 1915. It is comprised of many of his letters home interspersed with some narrative. As a despatch rider Watson was witness to many of the key events of the 1914 campaign. During Mons and the subsequent retreat he played a key role delivering messages, rounding up stragglers, and scouting for Germans. His account manages to capture some of the chaos that was experienced. Le Cateau, the Marne, the Aisne, La Bassee; Watson was present during all of these engagements and offers some insights into the action and conditions faced. At Le Cateau he witnessed the effect of German shelling on the British guns; he himself was under shellfire on numerous occasions and includes descriptive accounts of how the despatch rider would come to intimately know every curve and corner of a road and where not to slow down or stop due to shelling or sniper fire. The account provides some interesting vignettes about the life of the despatch rider. His work principally involved traveling between divisional and brigade HQ, occasional liaison with the French Army, being attached to brigades, or being held in reserve in case communication lines were cut. Locating units was a constant problem, particularly when they had moved. 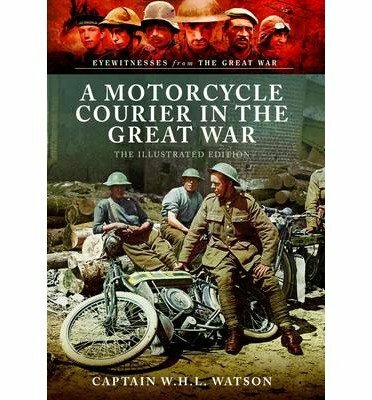 A great deal of the despatch rider’s time was spent waiting around – but this allows Watson to paint a picture of the places he went and the people he saw. The effort that went in to securing good food and billets features heavily, and the initiative British troops showed in gaining both is evident in many of the tales recounted. There is an interesting but brief mention of the perceived gulf between the despatch rider and the infantry – but the riders had been part of the retreat and advance, and had experienced many of the same privations and dangers as the infantry. Watson also mentions the disconnect he felt of returning home to England on leave, just a few hours form the front line but like a different world. The nature of the despatch rider’s work and the way the book was compiled means that frustratingly this is quite a disjointed a fragmented account rather than a comprehensive narrative. However given the date of publication and the fact it is based on letters home, this is only to be expected, and highlights how confusing the situation was to those on the ground at the time.